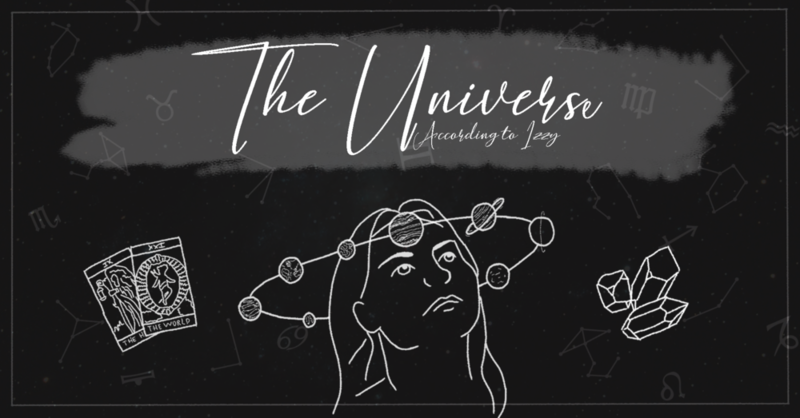 Welcome to the first instalment of ‘The Universe According to Izzy’! Here I will be exploring all things astrology and mystical. Hopefully it helps you make sense of it all, you might even discover some new truths about yourself along the way. Without further ado, let’s get into it! In the past I wrote an explanation of birth charts/moon and rising signs, so I highly recommend giving that a read first. Today we will be moving past that, to delve deeper into the depths of your chart. You can get a free birth chart from plenty of websites, I recommend here and here. But for a quick little tl;dr your birth or natal chart analyses where certain planets and constellations were at the exact time and place of your birth, and how this influences parts of your personality. So, in the same way that each Zodiac sign is said to have characteristics, where the planets line up with these constellations designates those characteristics to a particular aspect of your life. Ie your moon sign points towards your emotions and feelings, while your rising sign influences how you come across to others and the ‘first impression’ you give. Next in the birth chart sequence we have Mercury signs. Mercury is said to be the planet of the mind, and as such your Mercury sign determines how you communicate, think and process information. So it is both what you say and how you say it! Reflecting on your own Mercury sign, as well as those that you are close with, could help reveal the most effective way for you to communicate with others. Those with their Mercury in Aries will often speak without thinking and always are wanting to try new things. They may also lose interest just as quickly…. While it’s awesome that you’re not afraid to express your opinion, just make sure you leave room in the conversation for others to contribute. A Taurus in Mercury will be a ‘common sense’ type person who prefers to talk about their thoughts rather than their feelings. A Taurus Merc will work best in a secure and predictable environment, and trusts ideas that are time-tested rather than trendy. If you’re a quick talker and thinker who tends to get bored easily, chances are you have your Mercury in Gemini. These people can often be ‘the talkative one’ of the friend group, who is excellent at icebreakers and light conversation. They always have the most exciting (possibly exaggerated) stories! Anything to do with Cancer has strong ‘mom friend’ vibes. Big Mum Energy. Cancer Mercs are very sensitive to others’ feelings and needs and will always ask how everyone else is doing. They bond through conversation and have a real genuine interest in others. However, they have a strong need for comfort and reassurance… don’t be afraid to open up! Leo Mercs process information best when it is presented in a fun and playful way. These guys love big, bold ideas and thrive on a challenge. They get really excited about things and crave the spotlight when they speak. The ‘loud one’ of the group. Loves a bit of drama. A Mercury in Virgo means that you are a logical and linear thinker. You want everything to be planned and according to a schedule, which is great because you’re so organised! You can be a bit of a perfectionist but that also means that when you’re working, you’re super focused. Libra Mercs process information best verbally, through an understanding discussion. They are very diplomatic in their communicating and dislike any form of conflict. They have a bit of a reputation for being indecisive or flaky, so watch out for over-scheduling or double booking yourself. A person with a Mercury in Scorpio will love problem-solving, puzzles and figuring out how things work. They tend to be productive in short intense bursts of concentration. They are good at picking up other people’s subtle changes in body language, but ultimately work best alone. Sagittarius Mercs are great at getting along with anyone and everyone. They love to be goofy and express ideas through physical humour, although can sometimes blurt out comments without thinking. They love bold ideas, taking leaps of faith and can have a hard time sitting still and concentrating. If you love a clean-cut no-frills plan, then Capricorn might be your Mercury sign. These guys like facts more than feelings and always want to get straight to the point. They tend to process emotions in a linear way and are extremely motivated by their ambitions and goals. They prefer working alone. If you have your Mercury in Aquarius, you might come off as the ‘class clown’. You are witty, friendly and love to collaborate or work as part of a team. They love to make sure everyone is happy and are great out-of-the-box thinkers. Feedback is a key step in processing information. Last but never least, the Pisces sign. If your mercury is in Pisces, you are a very creative thinker and can get so absorbed in your work that you lose track of time. Pisces are often perceived as sensitive daydreamers and are always happy to lend an ear to a friend. You learn best in an artistic and creative way. Isabelle ‘Izzy’ Stackpool is in her third year of uni, double majoring in journalism and PR. She has a passion for travel, sushi and Harry Potter.